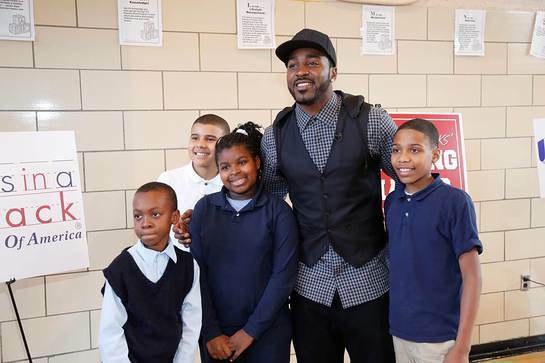 Hakeem Nicks' Helping Hands and UnitedHealthcare are teaming up with Blessings in a Backpack to provide healthy meals to more than 200 children at PS 15 in Manhattan and PS 102 in Brooklyn every weekend for a year. Helping Hands and UnitedHealthcare kicked off the second year of their collaboration with an event at PS 15, featuring health education, and physical fitness challenges and football drills with Nicks. “Access to healthy foods and staying active are critical to helping children thrive. This year, we are working with Blessings in a Backpack to get these bags of food into the hands of kids that need it the most and to keep these children fed on the weekends, when they don’t have access to meals at school,” said Nicks, who launched his Helping Hands program last year. “I am happy to again partner with UnitedHealthcare, which has a longstanding commitment toward helping people live healthier lives. Through our collaboration, we can help our local communities get healthy foods and snacks to children in need,” Nicks said. In 2012, nearly 474,000 – or one in four – children in New York City lived in households that did not have an adequate food supply, a 31 percent increase from 2006-2008, according to a study by the New York City Coalition against Hunger. UnitedHealthcare, a UnitedHealth Group company, serves nearly 4 million residents across New York with a care provider network of more than 200 hospitals and 60,000 physicians and other health providers statewide.